Last year I had to replace the extremely corroded V-shaped cross member that supports the swing keel and the upright members that support the bunks. 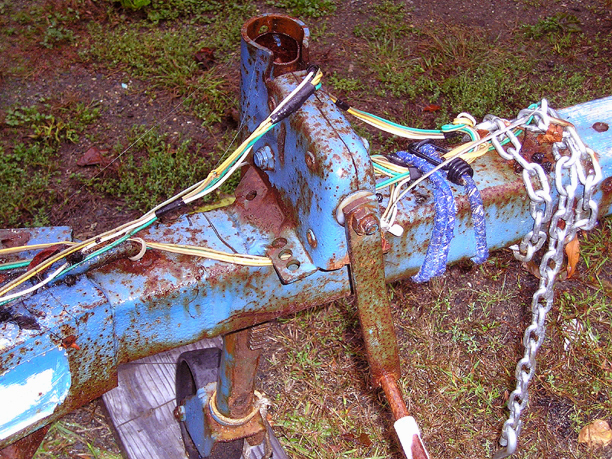 I also had to replace the winch, which was rusted beyond use, and its cable. 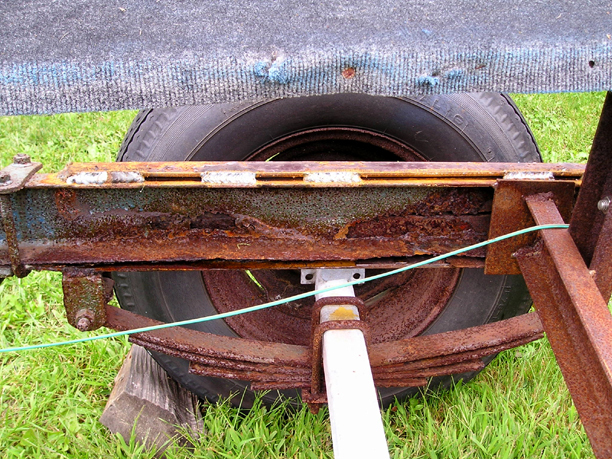 As I don't use the trailer except to haul the boat down to launch in the spring then recover it in the fall, I've long ignored its wear and deterioration. On its last legs, it did what I needed it to do, the minimum. But as I'm considering next year trailering Chip Ahoy up to Portland, Maine, and picking up my coastal cruise where I left off last month, I'll need a trailer that's in good shape. This is not that trailer. 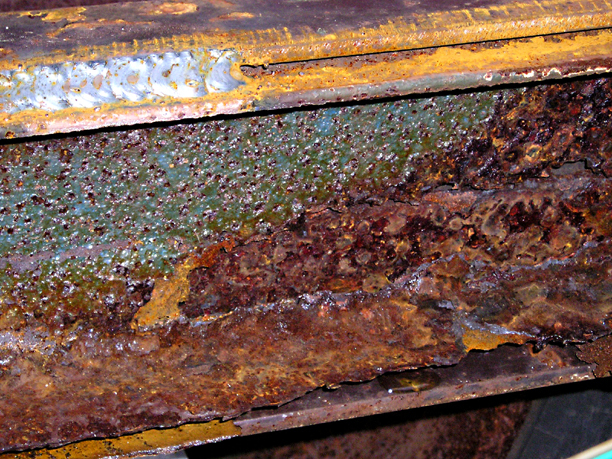 The first thing I spotted upon inspection was that one of the primary structural supports was corroded entirely through at a critical point, above the axle and leaf spring. Just to get the boat home from the boatyard a mere mile away required immediate repair. I took it over to my buddy Brad's shop on Tuesday and he welded a 3' piece of steel boxed on three sides over the corroded frame. It was a near-perfect fit with a little hammering. The original frame was corroded paper thin in an area of about a foot, corroded right through in places when we hammered it. 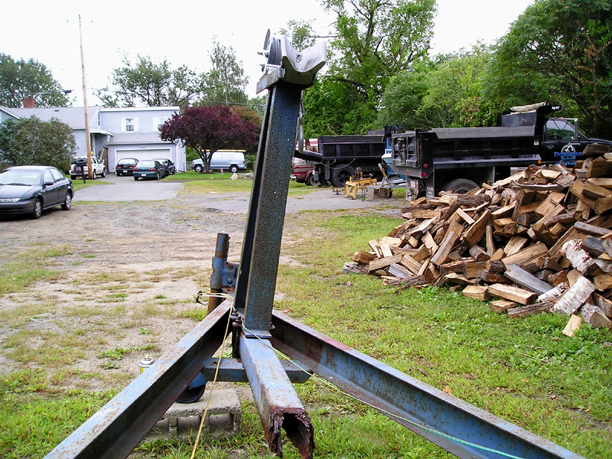 The new steel brace covers the old frame on three sides, and runs about a foot in either direction beyond the serious corrosion. 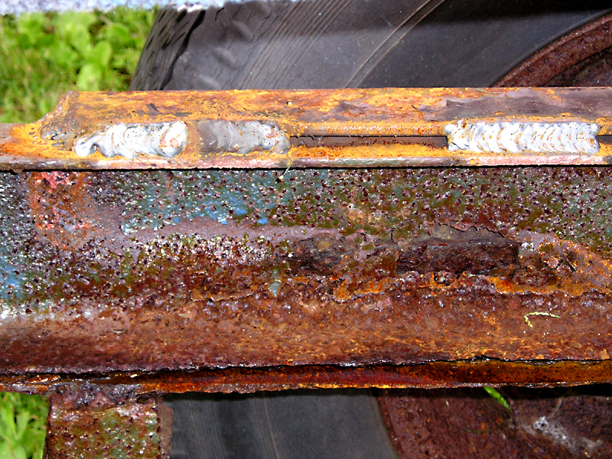 At least we were able to find good metal to weld to. 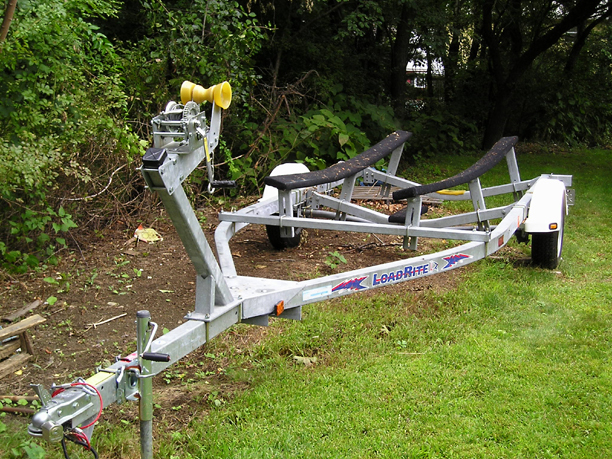 This'll get Chip Ahoy home for the winter, back into the water in the spring if necessary -- but I've decided I need another trailer as soon as I can locate a decent deal on one. 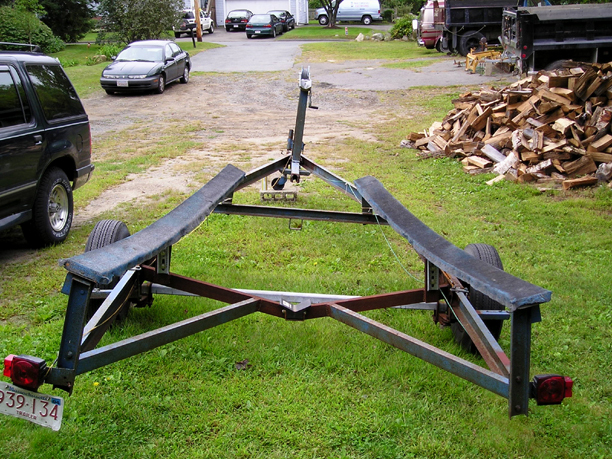 If I were to keep it, this trailer would need a whole lot of work; the bearings and races definitely need replacement, the jack at the tongue needs to be replaced, and the rest of the trailer is rusting out too. 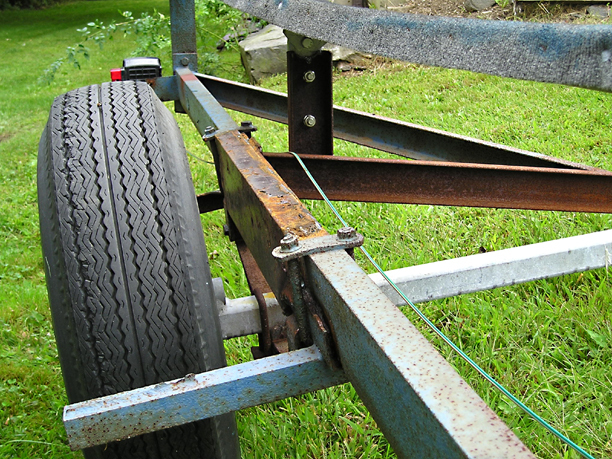 It's simply time to replace the trailer. Especially with the nearby and classic "Beauty and the Beast" comparison. A lot of inspiration for this decision comes from the trailer parked alongside mine, owned by my buddy C22 owner Wally Riddle of Nahant. 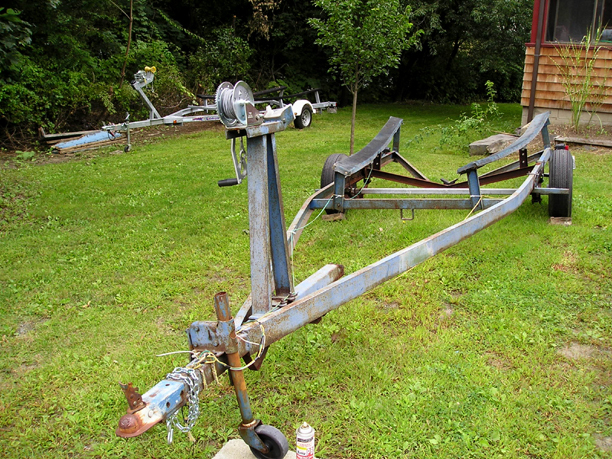 He parked it here in my yard this season until he hauls out his boat, and the side-by-side comparison is stark. If I ran into any trouble during my cruise up the Maine coast, he was going to come up and retrieve me with his trailer. His trailer would have easily made the trip up and back. Mine never would have. It's simply time for another trailer!